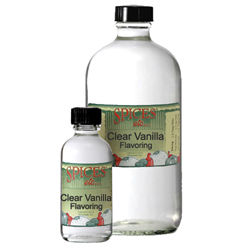 Clear Vanilla Natural Flavoring | Natural Flavorings | Spices Etc. 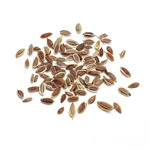 Clear Vanilla Natural Flavoring is concentrated and allows bakers to use as vanilla extract without adding vanilla extracts dark color to icings, baked goods and other sweets. 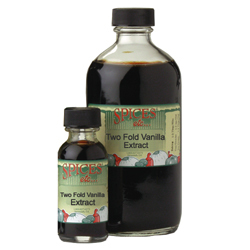 Made with Madagascar Vanilla Beans, use this vanilla when making white frosting for cakes and icings. Perfect for wedding cakes without sacrificing the high quality flavor of Madagascar vanilla extract. My decorated sugar cookies have won multiple blue ribbons at a local sugar arts competition. It's important to me that they taste as good as they look, and that's why I use your clear vanilla in both the cookie dough and the icing. 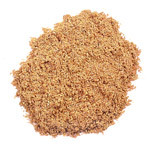 The flavor is wonderful, with no funny aftertaste that imitation extracts can have. Taste was very good. Not quite as good as regular vanilla extract but way better than the imitation clear vanilla. I use it to flavor royal icing I want to keep as white as possible. thanks for a nice product. Product is excellent. 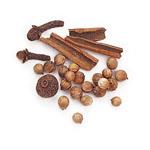 Adds flavor without the brown coloring in regular vanilla. Meringues and icing remain WHITE with great vanilla taste!!!!!!! 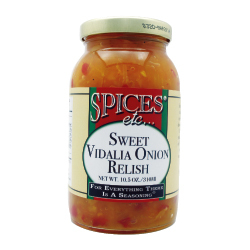 I have used this product for several years and am very happy with it. I recently had occasion to call and the customer service was outstanding...one of the things that I was so happy with was that I didn't have to punch all sorts of buttons...a live person actually answered the phone!